Anyone who’s gotten to the NHL the hard way has a story to tell. No one understands the game better than the guys on the fourth line who fight for their jobs every night. They know all too well what it’s like to watch from the press box or, worse, to be sent to the minors or traded. Sean Pronger has seen it all. He’s played for legendary coaches such as Pat Burns and gone head to head with Doug Gilmour and Steve Yzerman in the faceoff circle. He was on the ice for perhaps the most notoriously violent attack in recent hockey history. While playing in the minors in Winnipeg, he guzzled beer in an ice-fishing hut with grizzled veterans like John MacLean, and he caused international incidents with Doug Weight while playing in Europe. But none of that went to his head. 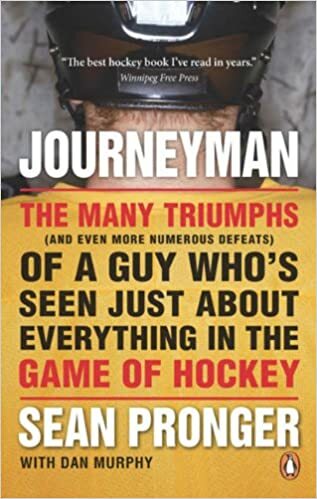 Full of hilarious stories and self-deprecating jokes, Journeyman is in the end a story not only about achieving a dream, but about realizing you’ve achieved it. least that year … on that team. (Left to right: Chris Hancock, Sean Pronger, Brian Armit) All I kept thinking was, “Isn’t this the guy who took a twenty-five-game suspension on Pierre Turgeon back in the day? I’ll be sure to keep an eye on him if I score.” This is a collector’s item. Without this shot there may not be a record of me playing for the Rangers … at least not in a game! This was the year I started to become a pro hockey player. I really wish things had worked out with the Kings.